If you are looking for a shaver that works wonders on your skin while removing hair, thanks to effective technology, the Braun Series 7 7898cc – Men’s Electric Foil Shaver, Wet and Dry with Clean and Charge Station Rechargeable and Cordless Razor is the right choice for you. When other shavers take two strokes to give you a clean shave, this cool model from Braun Series takes just one! That’s how effective this shaver is. You can now experience an easy, comfortable and time-saving shave every day. Let us go through our electric razor review to look at some of the features of this shaver and what makes it so special. Comes with clean and charge technology (Five-action alcohol powered system) through which the shaver is powered with automatic cleaning, lubricating and shaving options so that it lasts for a long time and cleans 99.99 percent of the germs present in the shaver. Comes with Opt Foil, which ensures that you get the closest of shaves; this shaver is regarded to be better than most of its counterparts in this category. All the Series 7 shavers from Braun have the Opt Foil technology. Flexible Shaving System as you can seamlessly blend the technologies of Micro Motion and Macro Motion, thereby exposing a good amount of skin to the shaver for smooth shaves. 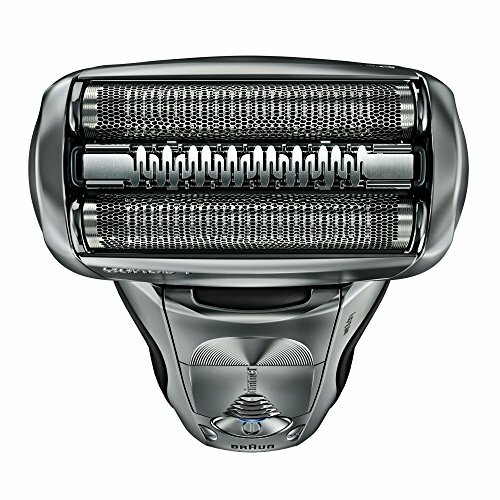 Macro Motion is 40 degree pivoting shaver head which contours over your skin for maximum skin contact. Micro Motion is the individual suspension of all cutting elements to respond to the smallest contours of your face. Waterproof model; can be immersed in water that is about 5mm deep which allows it to be used in the shower. Braun’s Sonic technology allows the shaver to automatically adjust to your beard’s density to make sure it uses more power when it needs to. This Sonic technology has 30000 cross cut actions per minute. 8-D contour adaptation allows the electric razor to capture more hairs in each stroke to make sure you have an efficient and comfortable shave by having 8 directional flexible shaver head masters which individually float and get to as close to the skin as .05mm. That is an extremely close shave. Protective SkinGuard smoothens the skin for an exceptional shaving experience. A foil shave works differently than a rotary shaver. A foil shaver moves back and forth rather than in a cyclical movement which helps minimize irritation to the face. 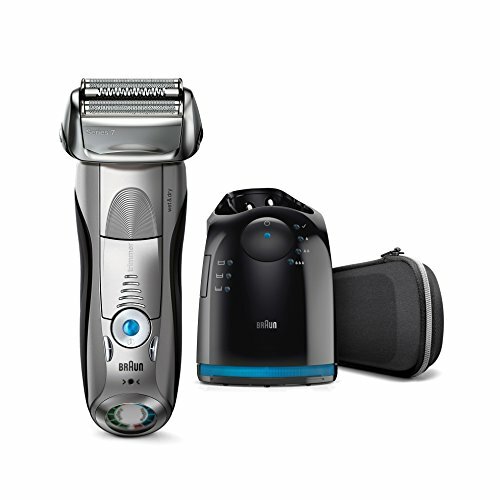 Braun recommends replacing all the cutter parts of the shaver every 18 months to ensure a good shave continues. Has a pop up trimmer for side burn trimming for other trimming needs. Has a head lock feature so you can get at difficult areas like under the nose or chin. Can be used wet or dry with foam, gel or no foam. A multitude of features, as listed above. 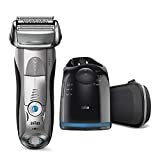 The Braun Series 7 7898cc Men’s Electric Foil Shaver, Wet and Dry with Clean and Charge Station Razor is one of the best electric razors on the market. It has many technologically advanced features to help you have a great shave every day. The 7898cc is very highly rated with 4.6 out of 5 stars with over 93% of the ratings over 4 stars or more. There are currently no 1 star ratings, which is rarely ever seen with at least over 100 ratings. We highly recommend this great razor. The price of this razor can be a lot to think about, and if you are looking for a more affordable electric razor we recommend you read our review for the Braun Series 5420 Electric Shaver Review. It offers many of the same features but a lower price point.